Patzcuaro was an important ceremonial center of the indigenous Purepechas people during the pre-Hispanic period. We stay in the heart of this beautiful town close to the two main plaza squares. In the morning we take a boat from the pier to Janitzio Island. 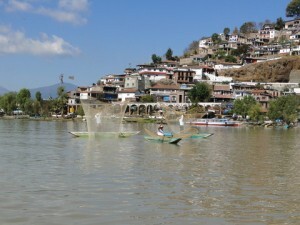 The Patzcuaro Lake in known for its white fish and we see fishermen using their traditional butterfly nets for fishing. The island of Janitzio consists of terraced housing packed along the hillside and has a population of about 3,000 people. 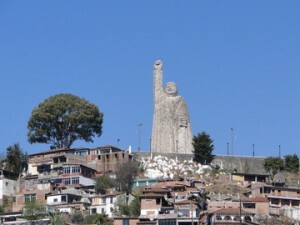 At the top of the hill is the statue of José Maria Morelos, a leader of Mexican independence. Within the statue are paintings by Ramon Alba de la Canal and other great Mexican muralists that recreate the life of Morelos. 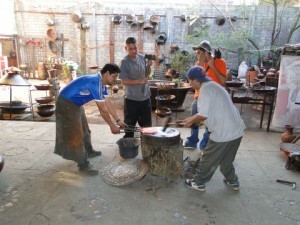 Next stop is a copper artisan’s workshop in the town of Santa Clara del Corbe. The copper workmanship is amazing and on either sides of the street are numerous stores selling copper pots, pans, jewelry and other art work.